With that bad start and a so-so cocktail, I placed my order. 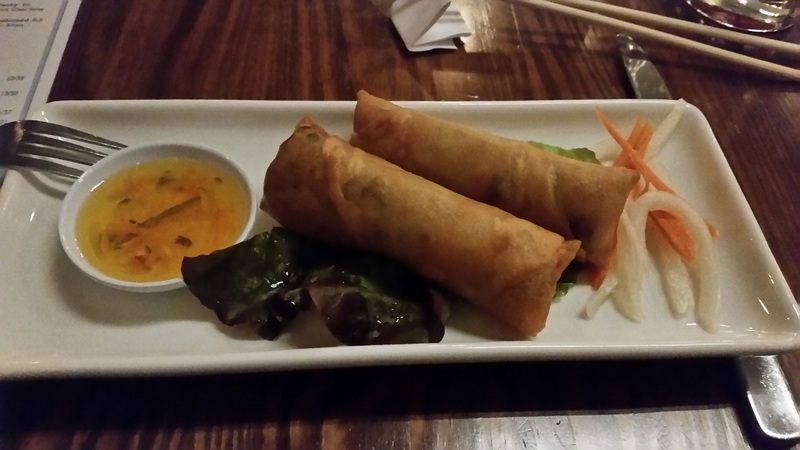 I was trying not to ponder all that when my starter arrived, the crispy egg rolls. It was actually really good, a good meat combination with some excellent flavourful mushrooms. Too bad it was only 2 pieces. Not soggy, cooked just right. My confidence was up now for this meal. 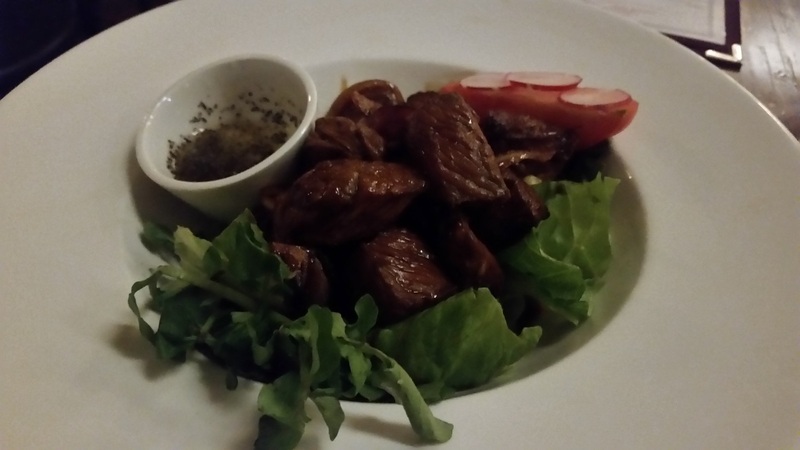 Then with a glass of wine my main arrived, the “shaking beef” which was the dish everyone raved about. Well, why? This was a boring beef dish that has nothing special whatsoever. The seared beef was tasteless, the “jus” did nothing for it except allowed me to eat more rice. If I got this at a cheap, local Vietnamese place home in Northern Virginia (where there is a big population) the place would be out of business within weeks… Very disappointing. And not very sizeable for a main (I didn’t have lunch). 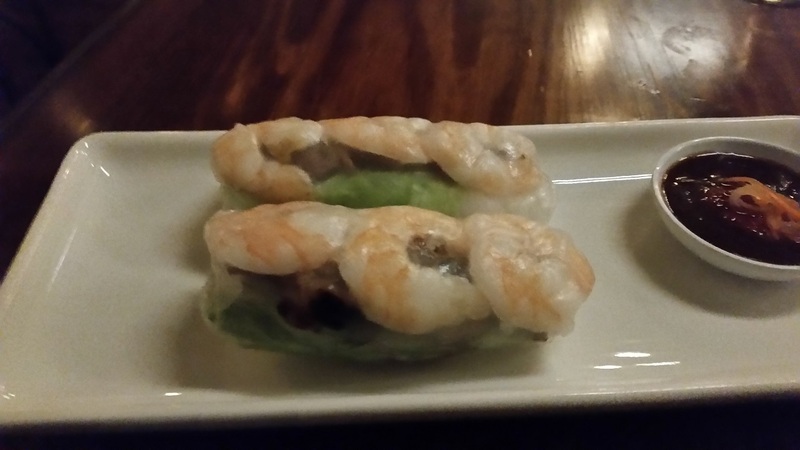 This was the summer roll, another typical Vietnamese treat. These again were excellent, full of flavour with the shrimp and meat, with the right balance of veggies inside. Done very well. Whoever is doing these appetisers is doing a great job. Not so on the main. It was a simple place, most seatings were outdoor and it was a order at the counter type of place. I ordered a few small plates and a glass of wine and relaxed — and tried to recharge my phone with the crappy external charger that lied about having enough juice to recharge a phone (added about 15% to my battery before it conked out). The food soon started to arrive. 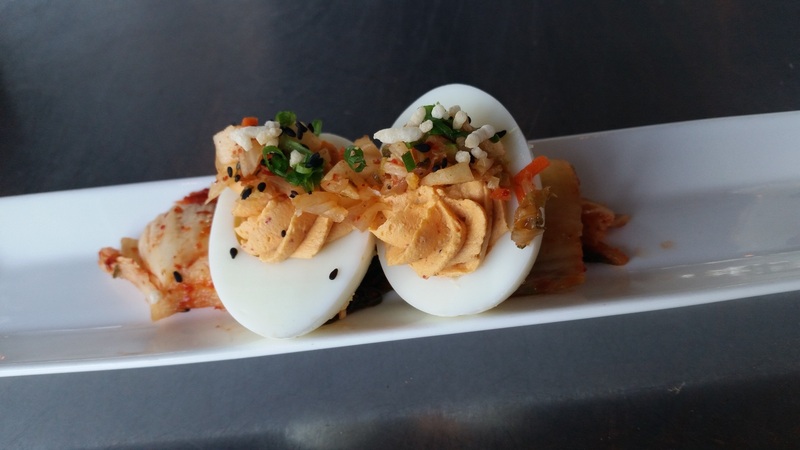 The first was a nice set of deviled eggs. very tasty, love the kimchee on bottom. 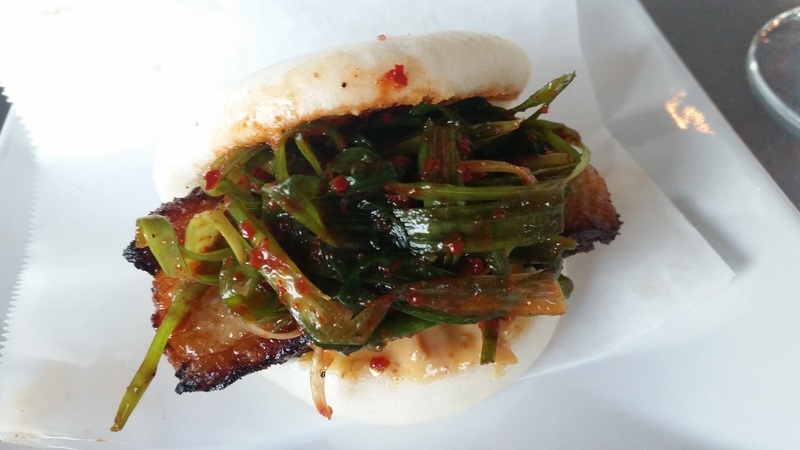 Then some good smoked pork belly bun. I got 2 of them. Nice and tasty, the spicy green onion worked very well. The fusion is certainly doing good now! 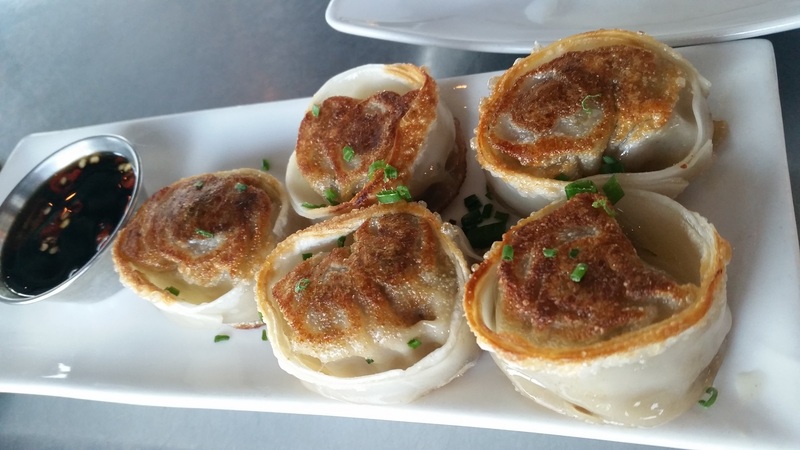 Then the last item, the beef mandu. Not bad, though I wish the fillings made a bigger impact than it did. Was rather bland compared to the first 2 items. But a good round of food! The food then arrived, and this was the jap-chae. Georgia drivers are the worst…and Atlanta is about the worst of the bunch. I was glad to be zipping out of this town, but there was a huge storm and idiots (especially those in grey cars) just refuse to turn their headlights on! Idiots! I fought through a nasty storm into Alabama and made a few stops (thank goodness, when the rain lulled). I visited the grave of the great educator Booker T Washington at Tuskegee University, and I also dropped into the legendary town of Selma — and visited the tomb of the “first gay” Vice President of the US, William Rufus King. Anyway, I went to the best restaurant in town for dinner hoping to mark this career-ender with a good night. I was told it should be quiet at Central this rainy Monday evening, but when I got there it was rammed. They said it was unexpected and it was beyond busy… They asked if I could sit at the bar and I was happy to do that. Cool bartender, and with drink in hand I was happy. I ordered and chilled out. Within a minute of ordering my starter arrived…geez, really? 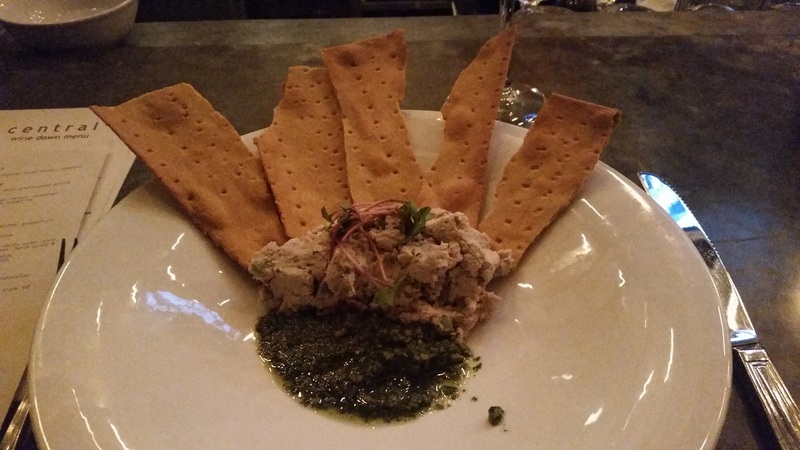 Smoked Alabama rabbit in a chicken-salad-like format. Worked pretty well as a snack. The mint pesto-like thing worked nicely. Not a bad start. Nope, I was right. The duck was cold inside and the skin utterly soggy. 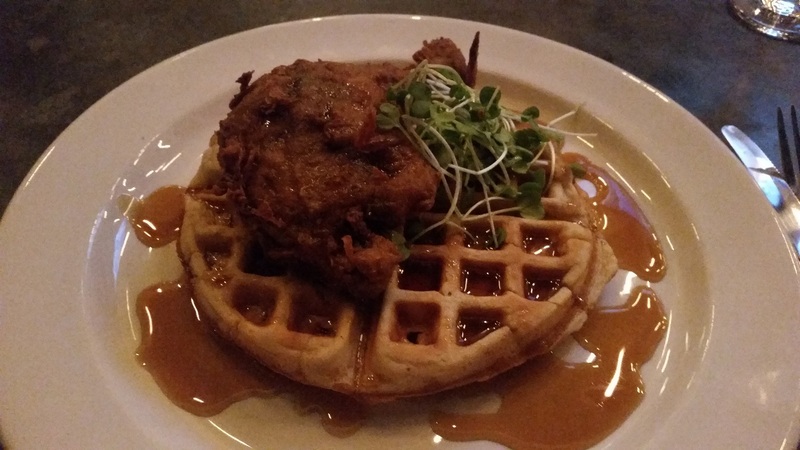 The waffle and the bourbon syrup was excellent, but that I could have had at any temperature. The duck was utterly abandoned. I suspect it was sitting there under a dodgy heat lamp on this very busy night. Kitchen taking shortcuts, poor stuff. The bartender noticed I abandoned the duck after 2 bites and asked why and I told him. He offered to replace the dish but my heart was not in it. They comped me instead. But I lost faith in this kitchen and didn’t want to risk anymore. Plus, I had leftover ribs in my room… I ended up having a bourbon and closing up. One of the nice parts about this trip is all the BBQ I’m enjoying. There was some fantastic stuff at Abrams BBQ near BWI (Baltimore) Airport, and there were some excellent stuff at both Smoque BBQ (Northside) and Lem’s Bar-B-Q (Southside) in Chicago. But now I’ve taken the game to Alabama. 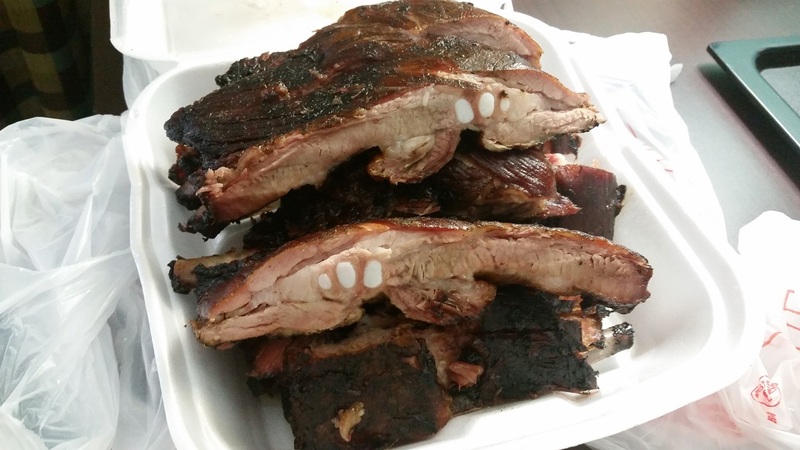 Sure, most people say the best BBQ in Alabama is in the north, around Decatur. However, this trip took me only to other parts of the state, first the Gulf Coast then the centre of the state. During the early stop I visited the much-praised Brick Pit in Mobile on the Gulf Coast. The Coast is not known for its ‘cue but I was told this was the place to go. Now they may look dry, but they are not. Smoked perfectly, the aroma was just brain-melting. Lovely flavour in the meat, deep smoke that made any sauce unnecessary. A wonderful job. 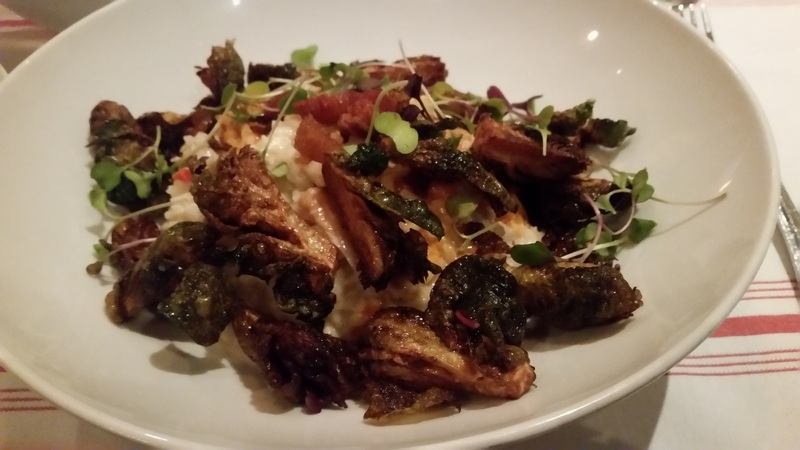 But I forgot this is Alabama and the portion was voluminous… It ended up partly as breakfast the next day (since I had to skip lunch for a long, long drive) as I had a wonderful dinner at Kitchen on George. These smelled wonderful. Again, it looks dry, but these are the juiciest ribs I’ve had in ages. Wonderful stuff, rich and deep in flavour. A little less smoke than in Mobile, but the flavour was richer. 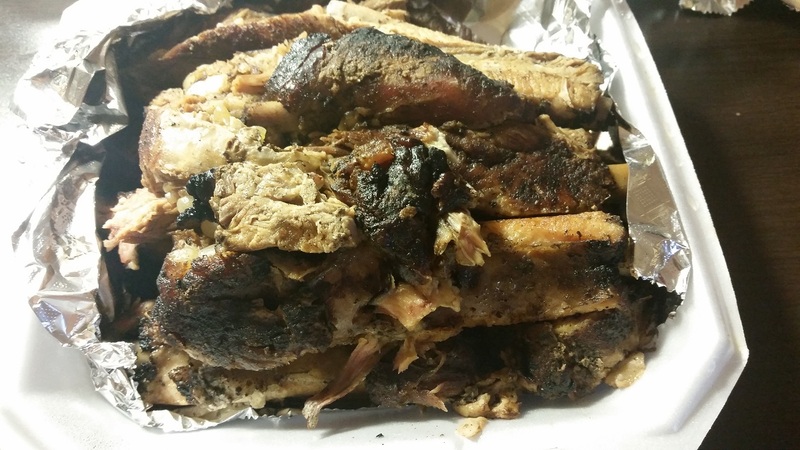 Some of the best ribs, ever. Again a crazy portion, but since I was skipping lunch again the next day it worked well as breakfast (thank you hotel room for the microwave!). So as people talk about north Alabama and Decatur for the best BBQ in the state, I found the ribs in both Mobile and Montgomery to be fabulous. Alabama BBQ certainly has my attention! I perched at the bar of this family-operated restaurant and had a wonderful evening of drinks, food and conversation actually. 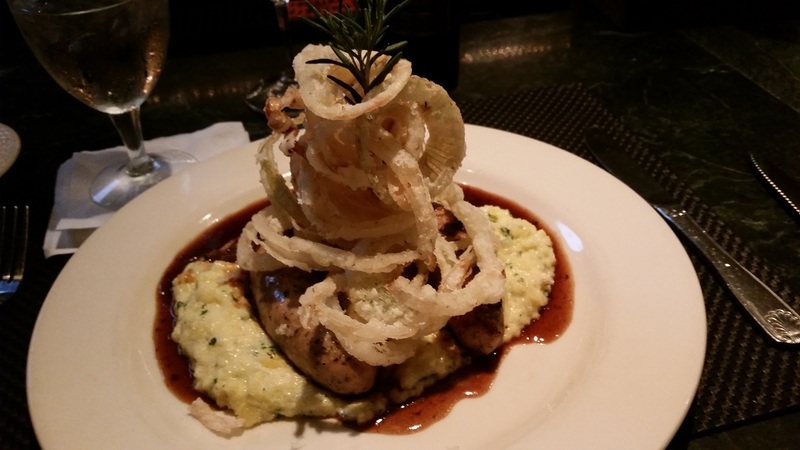 With a bourbon in hand I ordered and looked forward to the food — far more adventurous than I would have expected. 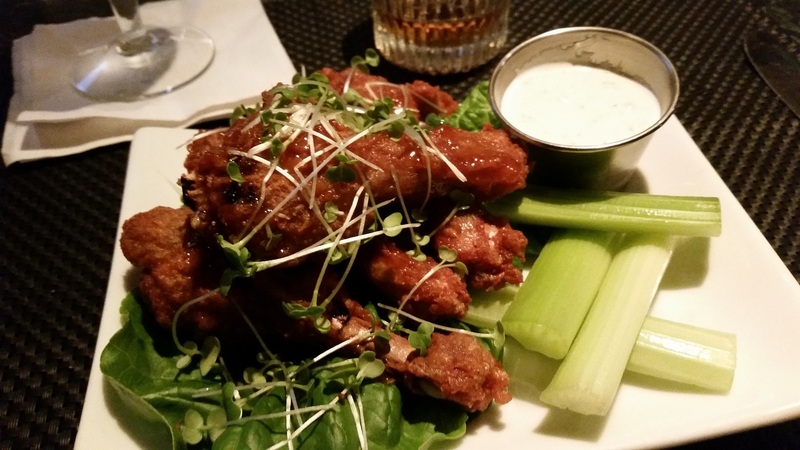 Chatted with the locals a bit before my starter arrived — wings. Sure, most of the volume were onion rings (which to be honest were actually not very good), but the rabbit sausages were absolutely gorgeous. Full flavoured and uncompromising, these were excellent. 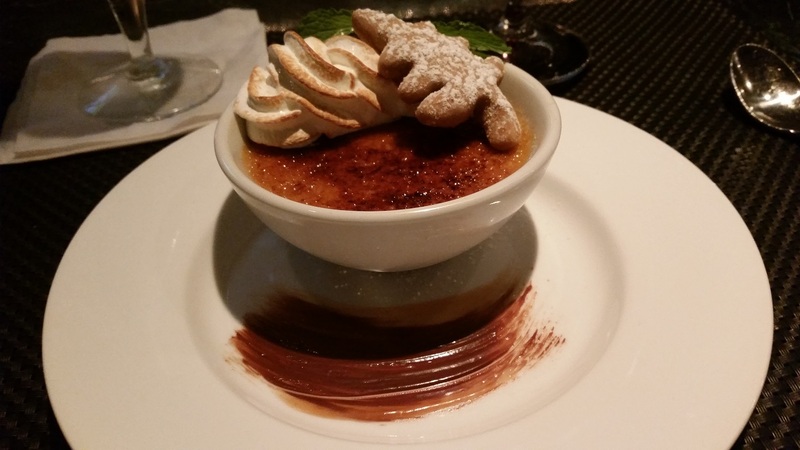 I enjoyed a bit of banter with the staff and locals and had a bit more drink before taking up a dessert — a sweet potato brulee. It was a long, long day. I had to make stops in Florida, Alabama, Mississippi before I made it back to Louisiana. Driving on US-90 a good part of the way, just coasting along the Gulf Coast, was a treat. Such a beautiful part of the country. Got back to New Orleans middle of the afternoon just in time to return my car, and hop on a streetcar for my hotel. I chilled out, re-packed all my stuff and got ready to head back out on the ever-so-slow streetcar for the very long trek out towards City Park for dinner at Toups’ Meatery. Now I’m not all that on “James Beard-y” places (my regular readers know my issues with these places…), but the write-ups I’ve seen for this place, alongside the menu, intrigued me. I got there after the 45-minute ride (which included a bus breaking down on the tracks, the driver going across the street to grab food, etc…oh NOLA…) and happily took a seat at the bar. Enjoyed some cocktails as I was not driving so… And I looked over the menu and that was fabulous looking (as was the bartender…) and I ordered. Wow, that was nice, Gulf seafood couvillion. Fabulous stuff, with excellent fish and mostly those awesome head-on shrimp. The heads were excellent. Lovely flavours here. Nice! I relaxed with a drink and timed it with the streetcar. I thanked the staff (especially that nice bartender) and headed out…but apparently they suspended the line with no warning… So I ended up back inside in 10 minutes and asked for a cab — and had a last glass of wine before heading out. Okay, NOLA, you rescued your rep in my eyes tonight. Bayona was good, but this was just excellent. This place is worth the trek, folks. Tonight I was planning to head to Kitchen on George, which is probably the best place to eat in Mobile — as I was told. I was looking forward to another good dinner, to see if Alabama can compete with the wonderful (and utterly underrated) Mississippi. I headed back into downtown Mobile in the evening and got to the restaurant just on time. The restaurant was busy but the bar wasn’t too bad, so I happily chose a bar seat. I enjoyed a cocktail as I looked through the menu and it looked excellent. I ordered and chilled out. If there’s one thing I noticed people in Alabama talked VERY loud… But I was more focused on my food, which soon appeared. 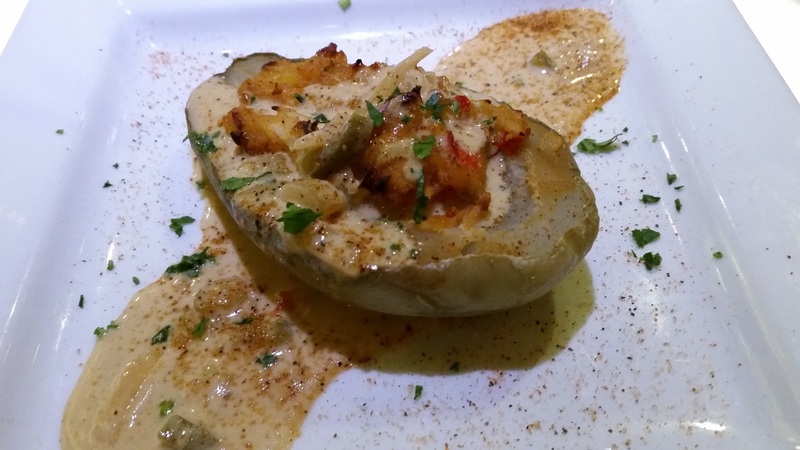 My starter was a wonderful crawfish-stuffed mirliton — or chayote. I don’t see these things being used enough, and this was just spectacular. 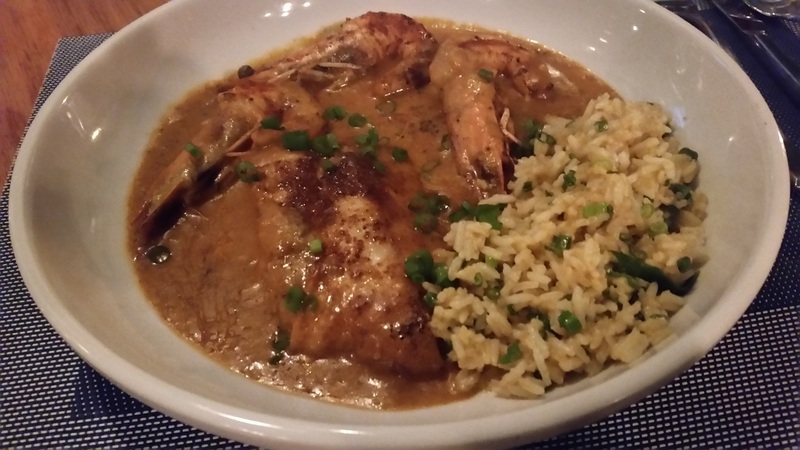 What lovely flavours mixed with the sauce and the fresh seafood — and the belly. This was one of the best starters I’ve had this year, totally fantastic! 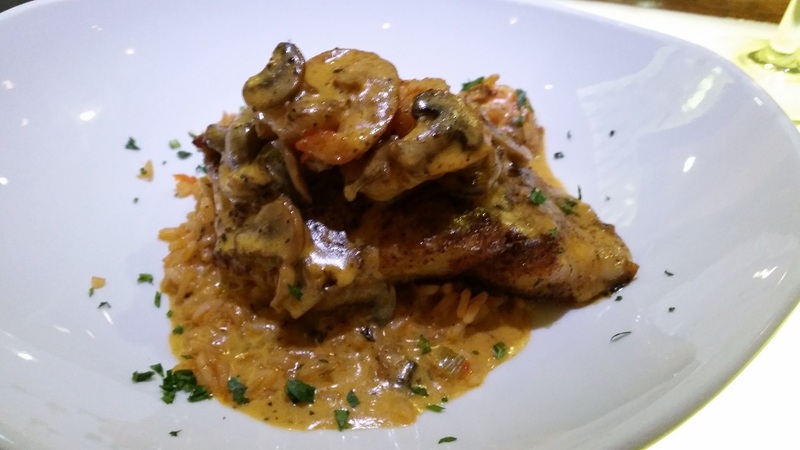 Grouper was the fish of the day, and this was lightly blackened, with a jambalaya supporting act. Excellent fish, solid flavours. 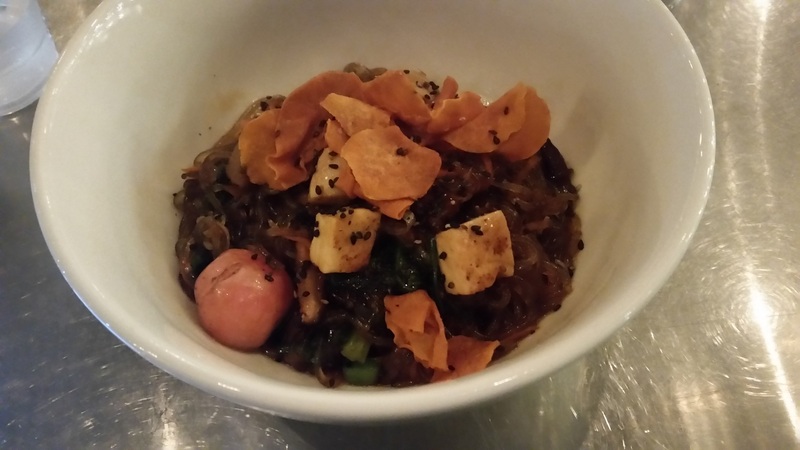 The jambalaya was also very nice, although a bit minute in portion. I was actually surprised with the portion size as I’ve seen enough “way too big” dishes in this part of the country, so a refreshing change. This was a very nice dinner and I decided I was full enough, as I had a huge ol’ BBQ for lunch (to be chronicled later). So I headed on back across Mobile Bay to chill out. Kitchen on George proved itself very well, and I still am dreaming about that stuffed mirliton. Fabulous. 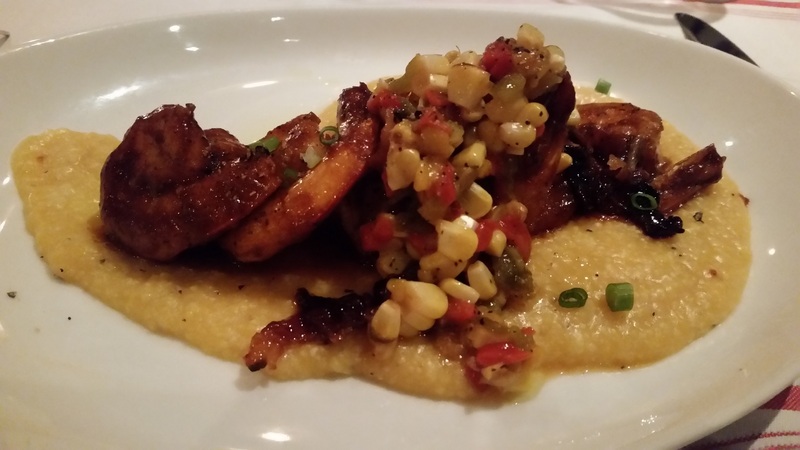 Honestly, my dinners in Jackson & Mobile just blew away every meal I’ve ever had in New Orleans or Atlanta. Why is that, and why do these smaller cities not get more love from the big-name food folks? I think only my friend Simon Majumdar hits these places off the “foodie track” and I applaud him for his efforts. Please, next time you’re thinking of just doing NOLA for food, try going a little further out. You won’t regret it, and Mobile proved it tonight.